The lovely Pustertal town Bruneck and its local mountain Kronplatz are only 30 kilometres away from your Leitlhof Holiday Hotel in Innichen. The main town in of the Pustertal municipal offers various sights and landscape highlights. The Kronplatz invites active holiday makers on its 2,275 high summit during the summer and the winter. At Bruneck Castle you will find the fifth of the six Reinhold Messner museum chain addressing the topic “Mountain – Human”. This exhibition looks at the inhabitants of the mountains and the interactions between different ways of life - the legendary Messner himself describes this project as his "fifteenth 8-thousand metre ascent". The MMM or Messner Mountain Museum comprises six museums in South Tyrol and the neighbouring province of Belluno. Mountain lovers will also enjoy visiting the other museums. The focus is not only on the mountains but also on the adoration and religious cults that they inspire throughout the world. Learn from Reinhold Messner’s knowledge and experience at the Messner Mountain Museum at Bruneck Castle. The project was completed in the summer of 2015 when the sixth and last Messner Mountain Museum was opened directly on Kronplatz mountain. At the foot of the Schlossberg you will find the town museum in Bruneck between Kapuzinerplatz and the access to the city. Marvel at the varied exhibition programme with modern and contemporary art. Apart from regional and national art, international exhibits are also shown like graphics, paintings, sculptures and photography. For a small consideration and subject to 7 days' notice, you can use the museum's own workshop. The visitor will not only dispose of ample space but also of lithographic stones and different printing presses for letterpress, flat and gravure printing. 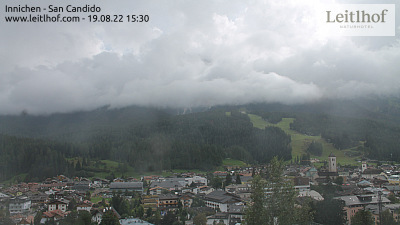 In summer, Bruneck becomes a holiday paradise. The Bruneck summer concerts fill the heart of the town with classical music, in the traditional farmers' market and in the Graben district you can stroll around to view the stallholders' wares and everyone turns up for the town carnival to let their hair down. A leisurely stroll is the perfect way to sample the regional speck (cured ham) bread and cheese varieties or pack them up for home - as souvenirs of an enjoyable holiday in South Tyrol. Many kilometres and quite an altitude await active cyclers in Hochpustertal. Experience the panorama-rich indulgence rides between Innichen and Mühlbach (a total of 100km with a 500 metre height difference) or cycle right from your Leitlhof Feel-Good Hotel over the Austrian border to Lienz. The Drauradweg cycle path follows the River Drau all the way to Villach in Carinthia Austria, but you can just do individual stages. Or you can opt for the Dolomitenradweg cycle path that takes through the Dolomites from Innichen to Cortina. Nordic Walking fans will get a right kick out of Europe’s biggest Nature Fitness Park at the foot of the Kronplatz. The area stretches from Bruneck over Olang to Rasen in Antholzertal and offers 220 kilometres of sign-posted paths. Enjoy your excursion destination Bruneck with all its attractions or just sit and relax in one of the cosy cafe shops and watch the hustle and bustle in the city. Send your no obligation holiday enquiry to the team at the Leitlhof Hotel in Innichen in the Sextner Dolomites and your holiday can start soon.